What does your land and soil need to provide all vital for us? With this theme I spent a lot of time observing a piece of land, just 5.700 m² in the year of 2010. The following years I started planting an edible forest garden in cool temperate climate with a pond system. 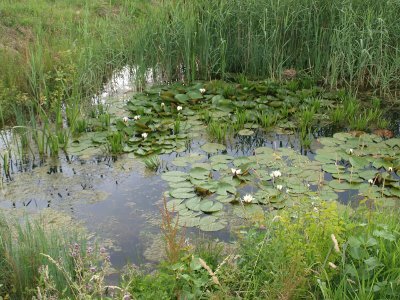 In 2011 I started excavation a pond, wringgling throgh the terrain. The excavated soil from the pond was formed into permanent hills. A diverse wild berry hedge was planted and I also planted the first fruit trees and berry bushes. Now there are around 30 different apple and pear varieties and also some exotics such as Indian banana, fig, jujube and others. In the meantime I exchange myself with forest gardeners in my environment, but also in distant lands, so I visited the edible foodforests of the Chagga people on Mt. Kilimanjaro and Mt. Meru in Tanzania and the so-called Spice Garden in the highlands of Kandy, in Sri Lanka. 2012 was the year with building activity, a spiral-shaped hut on stilts was construkted. The walls were infilled with straw bales and plastered with clay. In the following summers construktion work was going on, we implemented cordwood, bottles windows and other techniques. In the foodforest I was working out the understorage layers. My foodforest-watergarden is frequently by students and larger excursions. I also offer practical workshops on permaculture, forest garden, Terra Preta, solar dryer build, bread oven build. In spring and autumn I run very practical permaculture design courses in modules.